We are updating our phone system and from Monday 9 April 2018 we will have a new phone number. Please keep an eye on the Buzz and our website for further details. Teachers are the number one influence on child and student learning so understanding the profession is crucial for supporting all teachers to maximise their impact. The TRB is committed to quality teaching. That’s why we’re participating in the Australian Teacher Workforce Data Strategy (ATWD). 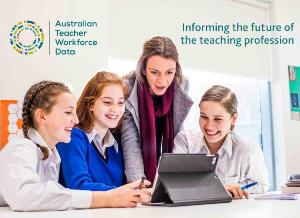 The ATWD will provide a national view of the Australian teaching workforce. While we have a strong understanding of teachers’ experiences and needs in South Australia, the education community needs a complete picture of teaching in Australia. Expressions of Interest are invited from registered teachers who would like to attend the Mathematical Association of South Australia Annual Conference. The conference is running from Thursday 26 – Friday 27 April at St Peter’s College, St Peters. The TRB has five sponsorships available with preference given to regional and temporary relief teachers. Applications close Friday 6 April. Find out more here. EduTech International Congress & Expo, International Convention Centre, Sydney. For educators, IT, leadership and administration teams featuring real life case studies and inspiring talks from world-class speakers. Thursday 7 & Friday 8 June. Find out more here. The Mathematical Association of South Australia is holding their Annual Conference on Thursday 26 & Friday 27 April at St Peter’s College. Members $220, non-members $297, students $55. Click here to register. Discover OneNote & Teams for Education on Monday 16 April, 10:00am – 3:30pm at Microsoft HQ Adelaide: Level 12, 147 Pirie Street, Adelaide. Cost $23. Click here for more information or to book. Reflective Practice for Learning & Growth: Using tech to save you time on Wednesday 18 April, 9:00am – 3:00pm at Microsoft HQ Adelaide: Level 12, 147 Pirie Street, Adelaide. Cost $15. Click here for more information or to book. MS EDU Meet on Tuesday 17 April, 9:00am-3:00pm at Flinders NVI, Level 2, Flinders at Tonsley, 1284 South Road, Clovelly Park. Microsoft Australia will be holding a new series of Educational Meets that will explore Micrsosoft technologies in the classroom. The Ignite sessions will allow teachers to showcase the amazing work they are doing in the classroom, followed by a Play session which will offer a series of challenges. FREE event. For more information click here. The Primary Mathematics Association SA is holding: Knowing the Mathematics Matters EASTERN METRO series, R-7 Educators - Exploring Geometry, Monday 26th March 4-6.30pm. Sessions start from $66 per participant (inc GST) for members or $55 if you come with a colleague! Non-members start from $88, and membership start from $0! Booking details at here or email the PMA office for more information. Drama SA is holding Middle School Professional Learning Community, for primary and middle school teachers. Saturday 7 April, time TBC. At the Windmill Theatre Company 2/234 Sturt Street Adelaide. Email Drama SA for more details. TRT’s: Creating an engaging and supportive learning day. On Tuesday 20 March, 4.15pm-6.30pm. Booking details here or email for more information. The Geography Teachers' Association is inviting teachers, particularly those working towards HAT or LEAD accreditation, to present at their upcoming conference (24-25 May, EDC Hindmarsh). It can be a full workshop or field trip, or a 5-10 minute starter activity in their NEW Geography Slam. For further information please email admin@gtasa.asn.au. Little Lessons Australia presents Madhavi Nawana Parker - Persistence and Independence: How to encourage it in our students. This workshop explores practical ways to teach students how to cope with learning and social challenges with greater emotional resilience. For K- Year 7 educators, SSOs, TRTs and pre-service teachers. Thursday 5 April, 4:30pm – 6:30pm at the South Adelaide Football Club, 1 Lovelock Drive, Noarlunga Downs. Cost $74. Book here by 21 March. For more information call 0438 752 877 or email Little Lessons. A new two hour twilight series. Participate in the series, or in any session as a stand-alone. The 3 Rs for Teachers Part 1: Building a successful year for ALL students. Wednesday 21 March, 4:00-6:00pm at The Highway, 290 Anzac Highway, Plympton. $75 per individual workshop, $210 for the series. For more information and to register click here. The 3 Rs for Teachers Part 2: What works for the students with complex needs in the classroom? Wednesday 30 May, 4:00-6:00pm at The Highway, 290 Anzac Highway, Plympton. $75 per individual workshop, $210 for the series. For more information and to register click here. The 3 Rs for Teachers Part 3: Using the 3 Rs ethos to prepare student/s for transition. Wednesday 5 September, 4:00-6:00pm at The Highway, 290 Anzac Highway, Plympton. $75 per individual workshop, $210 for the series. For more information and to register click here. Professional learning to support you to use two of Ann Baker’s effective numeracy block/maths lesson strategies is now available online: Mental Routines and Problematised Situations. Both release fortnightly to allow you time to engage with your class, practice, talk to Ann online and see what other teachers are having a go at. A combination of short videos, examples, information and a dedicated chat space courses. Costs are Individual: $99 each, Schools: $66 each. There’s a big focus on the importance of formative assessment now. This online course gives you an opportunity to engage in formative assessment strategies WITH your students – at your own pace. Based around an understanding that student voice is critical in learning, do this video/info/chat course WITH your students, build their learning ownership and engagement, and ensure you’re not working harder than your students! Do you need whole brain learning strategies to assist students to improve their learning and behaviour, their communication and organisation skills, their focus and motivation? Learn all 26 Brain Gym movements. Tuesday 17 April in Adelaide. The full 4 day Brain Gym®101 course April 17-20th includes specific goal setting strategies and repatterning techniques. Connect the brain and body to reach your full potential. Achieve your goals as you learn. Email me for more details: hgibbons@westnet.com.au or call 0407 978 335. Digging in to the World of Compost – Teacher Workshop. Join compost expert Georgia Pollard (Edible Gardens Project) in Adelaide Botanic Garden's Little Sprouts Kitchen Garden for a hands-on workshop and learn all about the wonderful world of compost! Wednesday 11 April, 4:30pm to 6pm at the Little Sprouts Kitchen Garden, Adelaide Botanic Garden. Cost: $20 (+ booking fee). Find out more and to book click here. The Hartley Institute is offering an extra Excel Intermediate/Advanced, on Friday 23 March, 9:00am – 3:30pm at the Hartley Institute, Cnr Capper Street and The Parade, Kent Town. Cost $220. For more information click here. Thinking of Leadership? How to demonstrate potential, prepare for the role and avoid common pitfalls. A PD Education Services session on Wednesday 2 May, 1.00pm-6pm at The Highway, 290 Anzac Highway, Plympton. Cost $120. To book click here. For further information contact Pam Dettman.